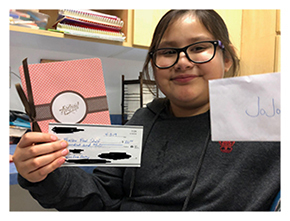 JoJo Laroque, a sixth grade student in the WHA middle school, received a $100 check from her pen pal as a donation to the WHA school pantry/food shelf. Our 2018-2019 Rotary Reading Challenge theme is Climb to the Top. The challenge will run from November 26-March 1. Each grade level created an English Language Arts-focused goal. The goals are listed below. Teachers also created student incentive and teacher resource wish lists to help achieve their goal. Thank you to the businesses/organizations listed below for sponsoring the Reading Challenge by fulfilling the wish lists. We will track student progress using a bulletin board that all students pass on the way to lunch. We kicked off the challenge on November 26 by showing a short video created by our Art teacher, Lynda Foster. 75% of preschool students will be able to identify 15 upper case letters of the alphabet by March 1st. 80% of students in kindergarten will be able to retell a story with a beginning, middle, and end with or without picture clues by March 1st. 1st grade students will increase 4 reading levels between November 29th and March 1st. 90% of students will increase 2 Book Levels between November 29th and March 1st. 90% of third graders will improve their adjusted DAZE score by 10 words between November 29th and March 1st. 80% of 4th grade students will read 10 novels at their lexile level with a minimum of 50 pages per novel between November 29th and March 1st. The 5th grade will increase their lexile by 15% from the beginning of the school year to March 1st.